Hohberger Latini continous vacuum cooker rated up to 300 lbs per hour – depending on product and application. Equipped with a Bulk Mfg Co jacketed processing tank rated to MAWP of 65 psi @ 350 Deg F and MDMT of -20 Deg F @ 65 psi, with shell and tube heat exchanger, vapor flash chamber, exhaust blower, Kinney liquid ring vacuum pump with tempature and pressure gauges. Was taking corn syrup and mixing that with a confection in a high temp continous process. Cooking tube: 18" Diameter, 52" Straight wall. Savage Brothers, natural gas fired, copper kettle cooker and mixer – with pounds of product per hour – depending on materials and application and machine configurations. Equipped with cast iron convection natural gas fired burner with 160,000 btu capacity, lift off lid, manual tilt handle and single action, scrape agitation with (5) 3" long x 3" wide scrapers and cage style safety guarding. Currently has 20" OD x 12" Deep, 11 gallon capacity copper mixing bowl. Control panels with agitation, power and alarm on / off switches with Omeron heat controllers. Mounted on heavy duty base frame. 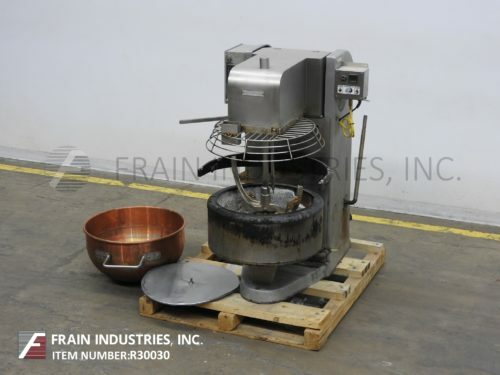 Savage Brothers, natural gas fired, copper kettle cooker and mixer – with pounds of product per hour – depending on materials and application and machine configurations. Equipped with cast iron convection natural gas fired burner with 160,000 btu capacity, lift off lid, manual tilt handle and single action, scrape agitation with (5) 3" long x 3" wide scrapers and cage style safety guarding. Currently has 20" OD x 12" Deep, 11 gallon capacity copper mixing bowl. Control panels with natural gas, power and alarm on / off switches with Omeron heat controllers. Mounted on heavy duty base frame. Theegarten, 60 Gallon, copper, single motion, vacuum kettle. Vessel dimensions: 32" in Diameter; 24" in Depth. Equipped with a dome top, 12½" diameter manway, sweep agitation powered by a two speed 5 hp drive, thermowell, 2¾" ID sight glass, top light, 5hp vacuum system and 2¾" diameter bottom discharge with manual slide valve and 22" ground clearance. Control panel with push button start / stop for agitation and vacuum pump. 30 Gallon, copper, single motion, vacuum kettle. 40 kg. batch size. Vessel dimensions: 24" in Diameter; 22" in Depth. M.A.W.P: 80 psig @ 324° F. Vacuum rating: up to 30 Hg. Equipped with a flip top cover, anchor type agitation, sight glass, swing out 24" diameter x 24" deep, vacuum bowl, 5hp Kinney vacuum system, jacket pressure guage, vacuum pressure guage, variable speed controls, and a hand tilt discharge. The cooking / kettle facilitates the mixing, heating, and cooling of liquids and liquid-solid dispersions.